The CMC® Cleveland-Kidder® WebPro Advanced Digital Web Tension Controller provides closed-loop control with tension transducer (load cell) feedback for a wide range of web tension applications. It can be easily configured for unwind brakes (pneumatic or electric), the unwind motor, intermediate tension requirements (between motor driven nips), the surface winder, the clutch winder, and the center winder with taper tension. It utilizes a 32-bit microprocessor and displays measured tension values in digital and analog simultaneously. 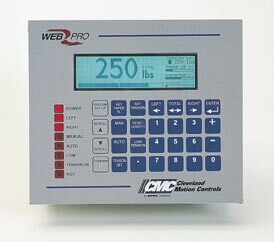 The WebPro Advanced Digital Tension Controller is available for either new machinery or as a retrofit. MWP-12664 WebPro Winder Tension Controller Controls tension on Center or Surface Winders via drives and motors or clutch. X44-31399 I/P (Current/Pressure) Electro-pneumatic Transducers For use with WebPro Unwind Tension Controller - Brake Type Accepts WebPro 4 -20 ma input and provides 0 - 120 psig output to brake. WebPro Controller mounted and wired along with stated accessory items in a Nema 4/12 enclosure. MWP-13511 WebPro Intermediate Tension Controller (MWP-12663) with Enclosure. MWP-13512 WebPro Unwind Tension Controller - Brake Type (MWP-12662-0) with I/P (Current/Pressure) Electromagnetic Transducer mounted and wired in an Enclosure. MWP-13514 WebPro Unwind Tension Controller - Brake Type (MWP-12662-0) with 24 VDC Magnetic Particle Brake Current Regulator mounted and wired in an enclosure.